Richard G. Peterson, The Winemaker. Meadowlark Publishing, 2015. I was going to title this review “A Life in American Wine,” but Richard Peterson’s autobiography is all-American through and through starting from humble Iowa origins on to university at Iowa State, a tour in the Marine Corps and then a Masters in Food Science and PhD in Agricultural Chemistry at the University of California at Berkeley (the Davis campus was not yet a reality). Quite a journey for a coal-miner’s son. Wine was part of the story from the early days. 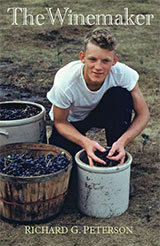 The photo on the cover shows Peterson making his first batch of wine in Iowa. The grapes were Concord. The year was 1948. He was 17 years of age. As he was finishing his Ph.D. in 1958 Peterson was approached to come work in a new research lab at E&J Gallo, which was at that time the third largest wine producer in the U.S. after Roma and Italian Swiss Colony. Gallo was riding high on the basis of the success of Thunderbird and they wanted scientific rigor as they worked on both developing new products and improving the quality of existing ones. In retrospect, this was probably one of the best places to be in American wine at the time as the Gallos were willing and able to put resources into wine research and development. Reading Peterson’s account of his time at Gallo and the people and products he found there is pure pleasure. It is a very personal account, not an academic study, and it gives the best insight I know into what was happening deep inside the industry in the 1960s when the foundations for the rise of American wine were being laid. Peterson moved his family to Napa Valley in 1968 and started a new job. Where do you suppose one goes from Gallo? It is easy to think about American wine as being sharply divided into industrial wine and craft wine, but I have always maintained that American wine is more complicated than that and Peterson’s next step proves it. After much thought and many interviews, Andre Tchelistcheff hired Richard Peterson to work with him and eventually to take his place at Beaulieu Vineyards, one of Napa’s crown jewels. Peterson stayed at Beaulieu through the sale to Heublein, leaving in 1973 and moving to an ambitious new project called The Monterey Vineyard. He stayed on as this project evolved into Taylor California Cellars with Coca Cola and then under Seagrams ownership. He moved to another ambitious new winery project, which Sue and I have recently visited. Today it is called Antica Napa, an outpost of the Antinori family in Napa Valley, but it was originally called Atlas Peak, a partnership between Whitbread, Inc., the British brewer, Christian Bizot of Bollinger Champagne and Piero Antinori. Peterson built the elaborate cave system that we visited on our trip among other achievements here. Gallo, Tchelistcheff, Antinori — quite a resume, don’t you think? Peterson’s book takes the curious reader through wine science, wine history and wine business. There are several key themes. One is the importance of quality, even for inexpensive wines. This could be called “the Curse of the Thompson Seedless Grape.” A second theme deals with Peterson’s experiences working with people who know the wine industry or are willing to learn (Gallo and Coca Cola get good grades here) versus those who don’t understand wine or prefer to be ignorant (Hublein and Seagrams among others). One of my favorite parts of this book is a story that Peterson tells about some consulting work he did for Fred Franzia. Fred wanted to make sure that the Bronco winery in Ceres was doing everything right, so he paid Peterson to come around regularly and be a snooping “Big Brother” — seeing all, hearing all, and calling Bronco out if there was an issue. Peterson had contracted with Bronco for wine stocks when he ran Taylor California Cellar and he had a high regard for the winery’s quality and consistency. The attention to detail he saw on his inspections explained it all. I was also fascinated by the brief section on Peterson’s work with Emile Peynaud. They couldn’t speak each other’s languages, but they found a way to speak wine, which I guess is a universal language. So many interesting stories here. Peterson is a lucky guy — what an interesting life! Richard Peterson is generous with his praise and sympathetic with those who made honest mistakes, but very sharp with people and companies who tried to take unfair advantage of situations. Not everyone will be pleased with how they are portrayed in this book. It is a very personal account of American wine, told by a real insider. It is very much worth a place on your wine bookshelf. Just back from a 4,200 mile wine road trip to NY and Ontario…had some amazing wines. A friend set up a meeting with his father-in-law who worked at Taylor since end of WWII. Quite an hour. Will be reporting it along with my other exploits in my blog, http://www.traderbillonwine.com this week. If only we could prevent corporations, like Coke, from buying up family wineries. Taylor was converting to vinifera vines at the time they were bought out; Coke had no patience. And he is still making wine! I just tasted the 2010 Hawk and Horse Cabernet – a winner.